Thursday-Saturday, March 26-28 at 8 p.m.
Wednesday-Saturday, April 8-11 at 8 p.m. Conceived on the boat of an asylum seeker, Fish Child hovers above the Woomera Immigration Detention Centre in the Australian desert, reluctant to be born. Her mother becomes enmeshed in an increasingly deadly struggle with a prison guard, bargaining for her child's future. 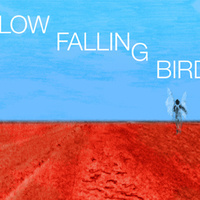 Slow Falling Bird explores the brutal realities confronting those who arrive unbidden in Australia's waters and the warping social and mental conditions on both sides of the wire, asking what kind of new life, and new society, can be born into such barren surroundings. By turns bleak and darkly comical, this play takes place against the wider background of a world with tightly patrolled borders and an increase of 'non-citizens' without rights. Part of the 2014-15 Georgetown University Theater & Performance Studies Program’s “Where We’re From: A Season of Origins and Migrations.” Written by acclaimed Australian-born playwright and Theater & Performance Studies Program faculty member Prof. Christine Evans, Slow Falling Bird is directed by Evans' long-time collaborator from Australia, Guest Artist Rosalba Clemente, Head of Acting at Flinders University Drama Centre.